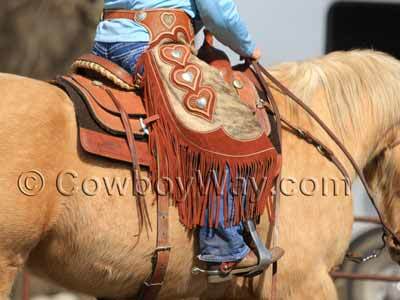 Chinks - Chinks, also called cowboy chinks, are leather leg coverings worn by cowboys and cowgirls for protection against brush, kicks, rope burns, and other hazards inherent to a cowboy lifestyle. 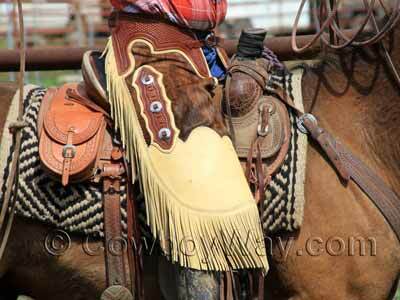 Below: Chinks worn by a working cowboy. Chinks are similar to chaps. 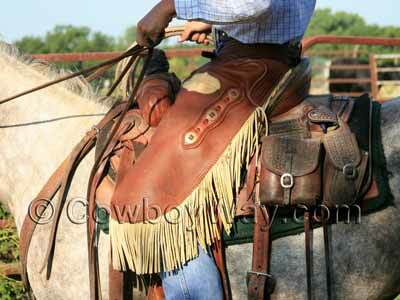 Both chinks and chaps are buckled around the waist and are open in the back so a rider's seat is not covered. Chinks, however, are shorter than chaps, stopping somewhere between the knee and ankle instead of running the full length of the leg. Chinks are also usually designed to be fairly open behind the leg, whereas chaps, depending on the type of chap and their design, might be fully enclosed behind the leg. The fringe on chinks is also usually longer and more prominent than fringe found on chaps. Whether a cowboy or cowgirl chooses to wear chinks or chaps is a decision sometimes based on weather (chinks are more commonly worn in warm weather), style associated with certain locales, or personal preference. You can shop for chinks here. Chinks come in a wide variety of styles. Below are several examples shown in photos. 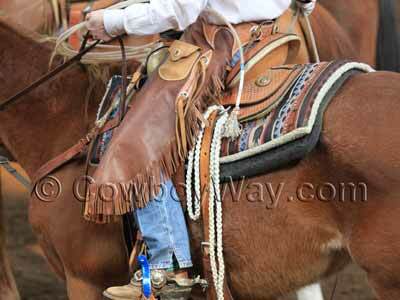 Below: Chinks being worn by a cowboy for roping and working calves. These chinks are one color with a pocket and contrasting fringe. 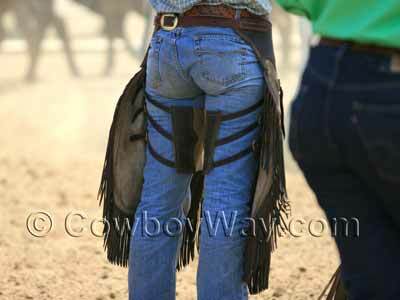 Below: It isn't just cowboys and cowgirls that appreciate the benefits of wearing chinks. 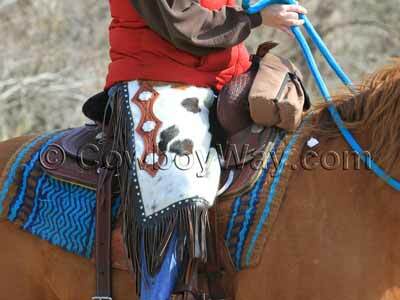 The pair below are being worn by a trail rider just before riding into heavy brush. These chinks have the hair left on the hide, and have a square cut to the bottom. Below: Hair-on-hide chinks with heart accents and long fringe. Below: Chinks with a pocket and shorter fringe. Below: The back of a pair of chinks. These chinks are mostly open in the back. Below: These chinks are more closed behind the leg than the pair above. "Chinks" is pronounced with a hard "ch" as in "chili," "choosy," or "chipmunk." Chaps, on the other hand, are pronounced with a soft "ch" which means they are pronounced "shaps."